Background : Son of James Patrick and Lily Coy, of South Melbourne, Victoria, Australia. At enlistment : single. No previous military experience. Brown eyes, black hair. Marks / scars : scar left cheek. 29/05/1940 Taken on strength by R.R.D., Caulfield, Victoria. 30/05/1940 Posted to 2/2 Pioneer Battalion, Puckapunyal Camp, Seymour, Victoria. 17/06/1941 Unofficially reported P.O.W. & transferred to "X" list. 18/07/1941 Rejoined unit & struck off "X" list (released P.O.W.). 07/10/1941 Evacuated 2/2 Field Ambulance (P.V.O.) & transferred to "X" list. 29/10/1941 Evacuated 2/2 Field Ambulance (malaria) to 1st Australian Corps Rest Station (1ACRS). 05/11/1941 Discharged from 1st Australian Corps Rest Station (clinical malaria unproven). 06/11/1941 Rejoined unit & struck off "X" list. 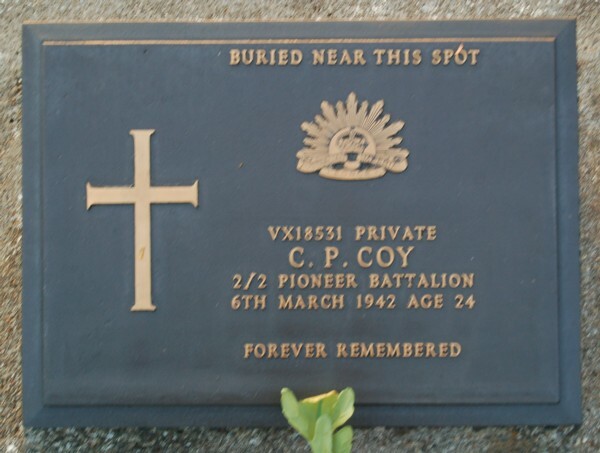 07/03/1942 Reported missing believed killed in action Java.